The children’s Choir is known as God’s Singers. 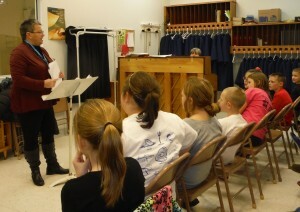 It is open to children in 1st-7th grade under the direction of Beth Dampf. They meet on Wednesday evenings through the school year. The choir performs one Sunday a month, September through May. During the 2016-2017 school year, God’s Singers became part of the Wednesday evening R.O.K. (Reaching Our Kids) program from 6:30-7:30 p.m. This program included Bible stories and crafts, as well as singing. Photos below show the choir in their R.O.K. tees and their choir robes. Copyright © 2019 United Church of Christ of California.